This way, you will never forget another appointment! With this useful magnetic board with the masterpiece 'The Night Watch' by Rembrandt van Rijn displayed on it, you will never forget another appointment or message again. 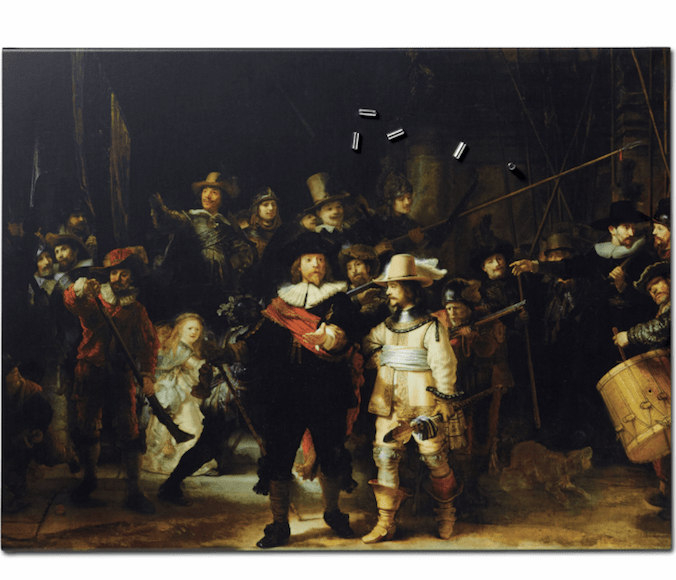 The Night Watch is printed in steel and mounted on a wooden frame of 2 cm thick, 30 cm high and 40 cm wide. 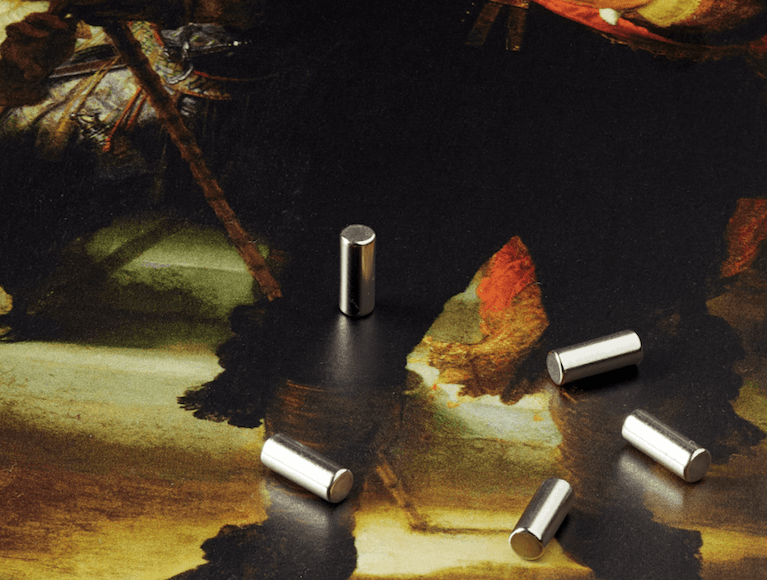 Five stainless steel magnets are supplied together with the magnetic board. A useful and attractive tool for your kitchen or office. This way, you will never forget another message! 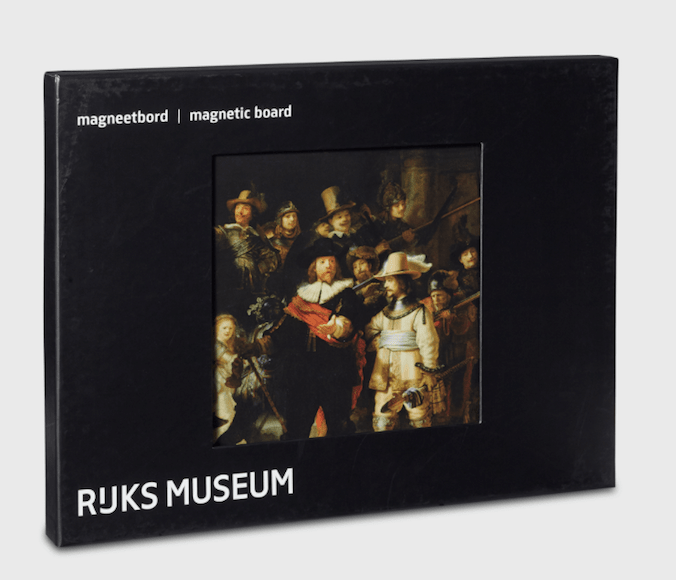 With this useful magnetic board with one of the masterpieces by Rembrandt van Rijn from the Rijksmuseum displayed on it, you will never forget another appointment or message again. A great asset for any house or office. The Night Watch. An unprecedented masterpiece. It is Rembrandt's most famous, and definitely his largest, painting. Rembrandt unveils in this painting the action and interaction between the people. This way of painting was very unique in Rembrandt's time, in the Golden Age. This is where Rembrandt shows his originality. With the help of light, the painter draws attention to important details, such as the hand gesture of the captain and the little girl in the background. Are you looking for a gift or a souvenir from The Netherlands? In addition to this magnetic board we also have a large umbrella and a collapsible umbrella with The Night Watch design. And, of course, other fashion and home accessories from the Rijksmuseum or the Van Gogh museum.